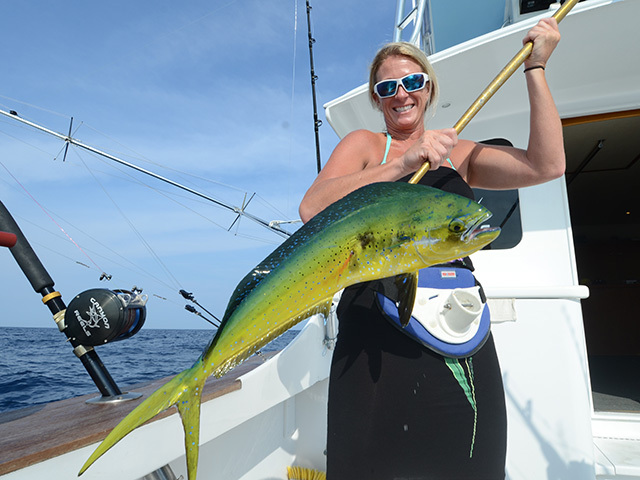 Rigs and tips to catch Mid-Atlantic bailer and gaffer mahimahi..
Dolphin put up a great fight on 30-pound trolling tackle. Attach a five-foot leader of 80-pound to the mainline with a snap-swivel to make it easy to switch rigs and stay in the game. All rods on deck! Dolphin anglers have to act quick when fish show up behind the boat. Keep bailing and trolling rods ready for any opportunity. Gold is a girl's favorite color. 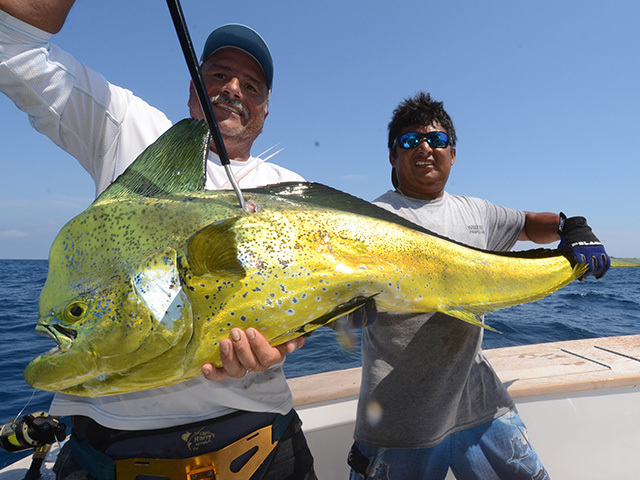 Dolphin make a great target for new anglers looking for fast action and a hard fight. When you hook one dolphin, let the fish take line and keep trolling, other fish are likely in the area. When a school of dolphin shows up behind the boat, drop a chunk of cut bait on a 3/0 hook. If the bailers stop eating, slow troll the chunk baits down the grassline to find the fish again. When leading a dolphin to the boat, hold the line low so the fish doesn't doesn't jump and throw the hook. 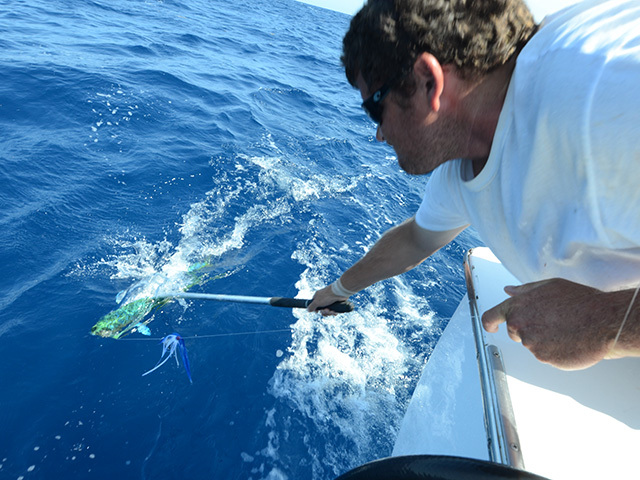 A six-foot gaff with a three-inch bite is perfect for dolphin up to 50 pounds. Big dolphin (this one went 45 pounds) can crash any offshore party. Troll a select ballyhoo behind a SeaWitch skirt to tempt large male dolphin called bulls. Dolphin fish grow fast, move fast and eat fast. To beat them, an angler has to be even faster. When a pack of gaffers (dolphin over five pounds) attacks the spread, speed is the key to getting the fish on the hook. 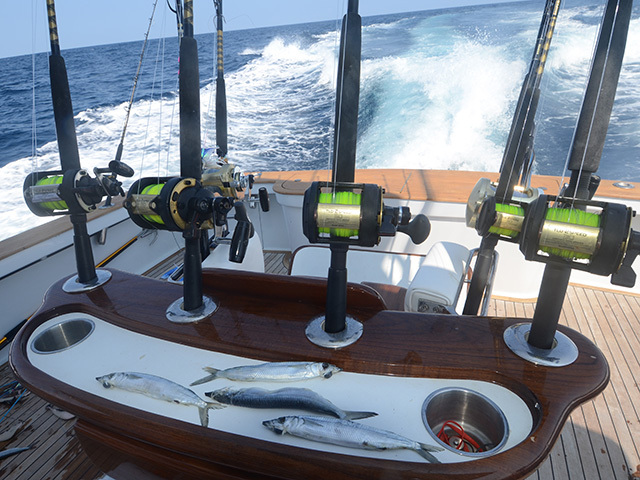 When bailers (dolphin under five pounds) appear behind the boat, quick moves will put fish in the box. Dolphin love structure. Find floating debris or a line of golden Sargasso grass and you’ll usually find dolphin hovering below. To make the most of the moment, be ready to bail. 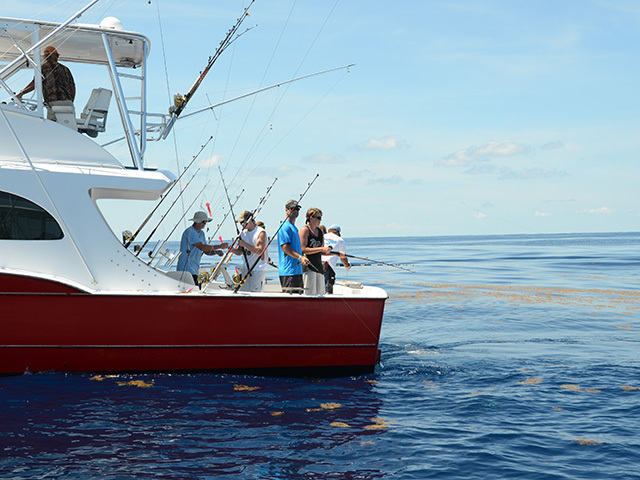 Before leaving the dock, rig one bailing rod for each angler. Start with a medium-heavy conventional combo spooled with 30-pound monofilament. Use a Bimini knot to a No-Name knot connection to add a 20-foot length of 50-pound mono shock leader. Slide a one-ounce egg sinker over the shock leader and tie on a 150-pound-test swivel. Attach a 6-foot length of 80-pound monofilament to the swivel and tie a 3/0, long-shank hook to the end. After rigging the rods, cut up a couple pounds of bait and chum. False albacore chunks are a dolphin favorite, but chunks of squid work well too. When preparing the albacore chunks, save one-inch-square pieces with skin on them for the hook baits and mince up the remaining meat for chum. Keep the bait chunks in one bag and the chum in another bag. Preparation pays off when you encounter a weedline or flotsam infested with dolphin. If you’re trolling, make a pass over the floating structure. The dolphin will usually respond by attacking the trolled baits. As you pull in fish, watch for other dolphin to follow. Then, break out the chunk baits and bailer rods. Keep one hooked dolphin in the water to keep the rest of the school behind the boat. Then, feed back bailer rigs and chunk baits. While anglers work fish to the boat, station one crew member over the fish box with a dehooker, bag of bait and chum and plenty of extra hooks. To land bailers, simply swing the fish into the boat, take a couple wraps on the 80-pound leader and use the dehooker to pop the fish off the hook and into the box. Then, re-bait and get back into the game. The key is to keep the dolphin interested. Throw out a few pieces of chum to pique their appetite. Keep a hooked dolphin in the water to lure others to the boat. If the fish fade away, have anglers feed their chunk baits 30 to 50 feet behind the boat and slow troll past the structure again. When the dolphin resume their attack, take the boat out of gear and the chunk baits will sink to feed the fish below. For some more fun, use a medium-light spinning rod rigged with a jerk-jigger or vertical jig (remove hook barbs) to blast feisty dolphin on light tackle. Larger dolphin are called gaffers because it usually takes a gaff to get them into the boat. Big dolphin will also hang below floating structure and along temperature or color breaks. Many times the fish attack trolled baits in the open water. 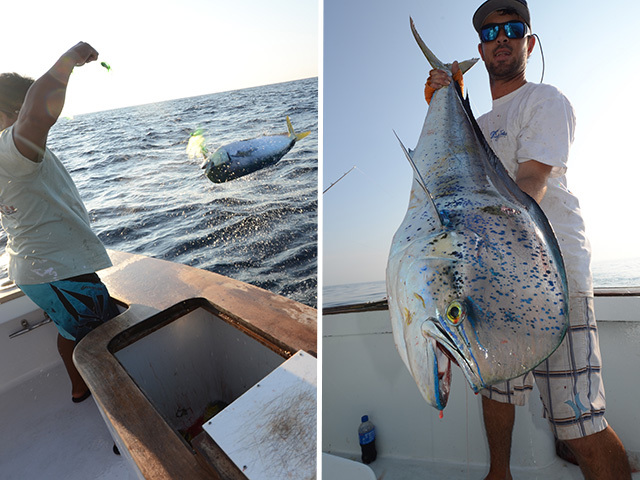 To target larger dolphin, troll small ballyhoo. Start with a 30-pound rod-and-reel combo spooled with 30-pound test monofilament. Attach 20-feet of 50-pound mono to the mainline with a Bimini to No-Name knot connection. At the end of the leader, use a Uni Knot to tie on a 150-pound-test snap swivel. For fast action, keep a few dozen dolphin rigs ready. Tie a 7/0, short-shank, “dink bait” hook to the end of an arm’s length of 50-pound monofilament. Slide a ¼ to 3/8-ounce egg sinker over the leader and twist on a 12-inch piece of Monel wire to hold the sinker in front of the hook. At the other end of the leader, tie a surgeon’s loop and attach to the snap swivel on the shock leader. Before rigging the hooks, prepare the ballyhoo. First, squeeze out the innards. Then, pinch the spine to break the bait’s back. Pop the eyes out with a wooden dowel. Sprinkle salt on the prepped baits to toughen the skin and preserve freshness. Insert the hook into a small ballyhoo by passing the point through one gill and exiting the belly so the egg sinker is below the ballyhoo’s eye sockets. Then, use Monel wire to lash the ballyhoo to the hook. Pass the Monel through the eye socket and around the back of the sinker once. Then pass through the eye socket and in front of the sinker. Next, push the tip of the Monel through the bait’s beak and wrap it around the leader and beak to keep the ballyhoo in place. When rigged properly, the bait will swim without spinning. When targeting dolphin, I run dink baits from the long rigger, short rigger and flat line. To mix it up, I might add a six-inch, jet-head lure or rig a skirted ballyhoo behind a chain of five, four-inch rubber squid. I stagger each line, setting each bait so it swims down the face of the boat wake. Troll at six knots and keep the reels in gear with about 10 pounds of drag. When the first dolphin hits, don’t stop trolling. With one fish on the hook taking line, keep the boat moving to entice more fish to bite. Dolphin rarely travel alone. Continue to troll for 30 seconds or more until all lines are tight with dolphin. Even while fighting the fish, keep the boat moving ahead at two knots to keep the lines straight. Many times the dolphin will attack baits floating just under the surface. As the angler works his dolphin to the boat, keep the bailing rods ready. Other dolphin will often follow their buddy. Dolphin are quick to bite and quick to get off the hook. Their favorite trick is to jump wildly and throw the hook. As the dolphin gets close, one crew member should hold the gaff in one hand and keep the leader in the other. Hold the leader low to the water to keep the dolphin from jumping. Guide the fish in while the angler takes up line. When the dolphin is within range, reach out with the gaff (tip pointing down) and insert the gaff. Then, swing the fish over the gunwale and into the fish box.